SM Energy, formerly St. Mary Land & Exploration Company, targets the Eagle Ford Shale's wet-gas window in Webb County, TX. SM also has a non-operated interest in acreage owned by Anadarko that covers the liquids-rich and oil windows of the Eagle Ford in Dimmit, Maverick, and Webb counties. The Eagle Ford is core to future growth for the company as just the Eagle Ford alone could double the size of the company on a production basis. The company made headlines in June 2011 when it sold 15,400 acres to a partnership of Talisman Energy and Statoil for $225 million or $14,600 per acre. Before the divestiture, the company had an interest in approximately 250,000 net acres in the Eagle Ford. SM Energy is an oil and gas exploration and production company based in Denver Colorado. Its assets are primarily located in the ArkLaTex Basin (Louisiana and Texas), Gulf Coast Region (South Texas), Mid-Continent Region (Oklahoma), Permian Basin (New Mexico and Texas), and the Rocky Mountains region (Montana and North Dakota). The company also has a position in Pennsylvania's Marcellus Shale. The company was named after St. Mary Parish in Louisiana and founded as St. Mary Land & Exploration Company. SM Energy stock is listed on the NYSE under the symbol SM. SM has field offices in Laredo, Catarina, and Houston that service the Eagle Ford Shale. Operated net production in the Eagle Ford shale averaged 207.1 MMCFE/d in the second quarter of 2012, a 16% increase from the first quarter production of 178.3 MMCFE/d. During the second quarter of 2012, SM Energy operated six drilling rigs on its operated Eagle Ford shale acreage. Starting in 2012, most drilling activity has been focused on drilling multi-well pads, and as a result, the well completion schedule for the year is weighted toward the second half. During the first half of 2012, the Company completed 26 wells in the operated program. Production in the second quarter was impacted by downstream pipeline curtailments in April and further constrained by continuing delays in the installation and start-up of new field production batteries on the third-party operated gathering system. These delays are being caused by later than expected deliveries of equipment resulting from increased industry demand. Based on the current schedule for delivery of midstream equipment, the Company now expects to complete 67 wells in 2012. In the non-operated portion of the Eagle Ford program, net production for the second quarter of 2012 averaged 9.5 MBOE/d. The operator (Anadarko) ran approximately nine drilling rigs and one spudder rig during Q2 of 2012 and is expected to continue at the same activity level throughout the year. Anadarko recently accelerated the expansion of the midstream assets, which is a non-carried expense under the carry agreement with Mitsui, causing an increase in the amount of capital invested in this system by SM Energy in 2012. 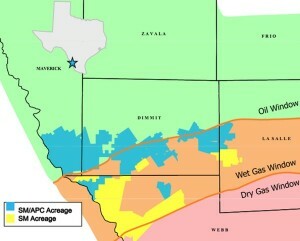 Operated net production in the Eagle Ford shale averaged 178 MMCFE/d in the first quarter of 2012. This was a slight decrease from the previous quarter and was in-line with the SM's production forecast for the quarter. The expected decline was due to the combination of the Company's shift to pad drilling during the quarter as well as higher levels of down-time on base production due to nearby completion activity. During the first quarter of 2012, SM Energy operated five to six drilling rigs on its operated Eagle Ford acreage, and exited the quarter with six operated rigs. The Company plans to release one of the rigs during the second half of the year, exiting 2012 with five operated rigs. In the non-operated portion of the the Company's Eagle Ford program, net production for the first quarter of 2012 averaged 12.9 MBOE/d. This amount reflects the reduction in its working interest as a result of the transaction with Mitsui in December of 2011. The operator ran approximately 10 drilling rigs during the first quarter of 2012. The Company had 84 wells drilled and completed in its operated Eagle Ford shale program as of the end of 2011. Of this amount, 44 were drilled and completed during 2011. SM Energy slowed the rate of increase in operated Eagle Ford activity in the second half of 2011 to accommodate continued investment in the non-operated Eagle Ford program until the Acquisition and Development Agreement ("ADA") with Mitsui E&P Texas L.P. (“Mitsui”) was completed. SM Energy is currently operating five drilling rigs on its operated acreage in South Texas. The Company plans to operate a five to six drilling rig program throughout 2012 and has allocated between $650 million and $700 million to drilling and completion activities. During 2012, the drilling program will include three drilling rigs that are designed for pad drilling. In the non-operated Eagle Ford program, SM Energy expects substantially all drilling and completion costs will be carried pursuant to the terms of the ADA with Mitsui. The Company will, however, remain responsible for investments in items such as infrastructure net to its proportional ownership. Operated production in the Eagle Ford shale averaged 128 MMCFE/D, a 32% increase over the previous quarter. This increase was made possible by the addition of downstream wet gas transportation capacity made available during September by the start-up of the third party owned and operated Eagle Ford Gathering LLC pipeline. Production volumes on both operated and non-operated assets were at levels lower than the Company's internal forecast due to intermittent downstream constraints and construction related downtime on midstream facilities in the field, as well as a higher percentage of wells being shut-in for offset completion work during the quarter. During the third quarter, SM Energy operated an average of 3.5 drilling rigs on its operated Eagle Ford acreage with 4 rigs running at the end of the quarter.....A fifth rig is anticipated to be in the field by year end and the Company expects to run 5 rigs in the field throughout 2012. During the quarter, the Company continued experimentation with down spacing pilots, longer lateral wells, and revised completion methods. By year end, the Company will have 8 pilot areas drilled at well spacing tighter than 1,250 feet. As previously indicated, data from the earliest of these pilots should be useful by year end 2011 to determine optimum spacing plans for future drilling. In general, the Company expects that optimum development spacing in the shallower and oilier areas of the field will be tighter than in the higher productivity areas. With the addition of rigs designed for pad drilling, SM Energy has begun drilling three well pads in its operated Eagle Ford shale program. These pads are expected to reduce the time to drill the wells and lower the associated cost of each three well pad package by roughly $1 million. In the non-operated portion of the Eagle Ford program, the Company fully participated in Anadarko Petroleum Corporation's drilling program, which operated approximately 10 drilling rigs during the third quarter of 2011. "SM Energy is currently operating four drilling rigs on its operated acreage in South Texas. The focus of drilling activity during the second quarter of 2011 was to drill spacing pilots and test alternative completion designs. Data from this testing should be available to guide development activities during 2012. During the second quarter, the build-out of operated midstream facilities was commissioned to an outside party under the terms of a previously disclosed gas gathering services contract. Gas takeaway capacity during the quarter continued to be below contracted amounts due to restrictions on downstream third-party infrastructure. Previously announced capacity from another outside provider is anticipated to be available to the Company late in the third quarter of 2011." "As previously announced, during the second quarter of 2011 the Company entered into two separate transactions related to its Eagle Ford shale assets. These transactions are scheduled to close during the third quarter. Post-closings, SM Energy will have approximately 196,000 net acres in the play. SM Energy and Mitsui Eagle Ford JV agreement is reached. “...SM Energy is currently operating three (3) drilling rigs on its operated acreage in South Texas. The Company plans to increase its operated rig count to six (6) by the end of 2011. The drilling focus continues to be on areas with higher BTU gas content and higher condensate yields. The Company has secured multiple firm transportation agreements to increase future take-away capacity as production continues to ramp up.